- More convenient distribution model: the download version no longer requires you to run custom tools to generate an ISO image first; instead download versions are ready-to-run on all platforms now! - Ready for the killer plugin! 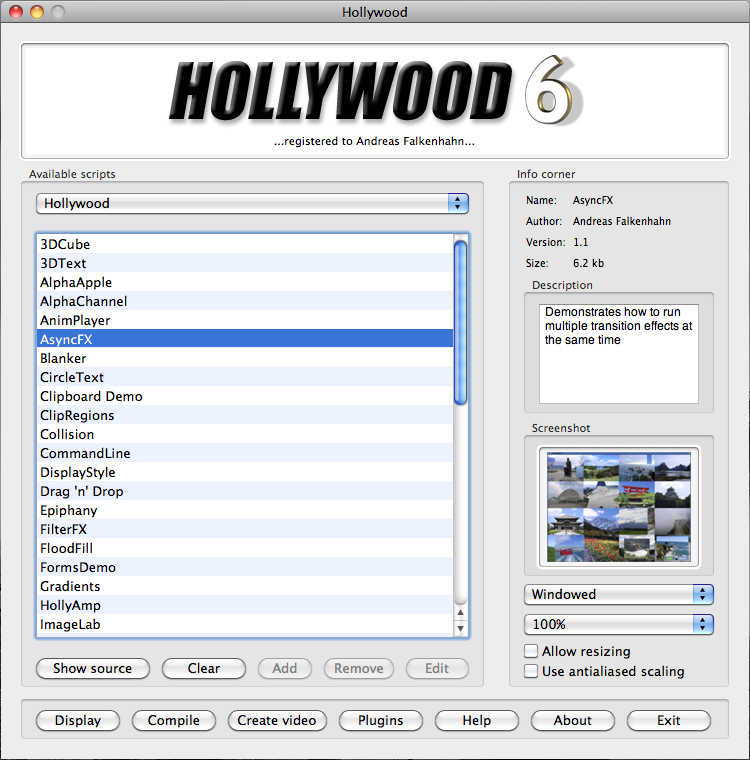 Hollywood 6.1 is the ultimate Multimedia experience and a must-have for all creative people. Hollywood is available on a CD-ROM and as a download version. Both versions include Hollywood for all supported platforms. It is no longer necessary to buy separate licenses for the different platforms. Buying Hollywood gives you a single-user license for all 11 platforms supported by Hollywood. If you already own Hollywood, you can buy a discounted upgrade version. People who bought Hollywood 6.0 in 2016 can request a free upgrade. All this makes Hollywood The Cross-Platform Multimedia Application Layer. Join the Multimedia revolution and get your personal copy of Hollywood 6.1 now! Is the WIndows10 choose screen bug fixed in this release yet? I am currently making the finishing touches on a small program ordered from me, targeted of course windows (but working on Amiga). Two hours before the announcement was online, thinking on the correct method of saving program preferences on different windows systems. Now 6.1 is installed, and just implementing preferences saving by the new SavePrefs() function. Ughhhh.... can't wait to collect enough "bling bling" to register Hollywood. Andreas, thank you for your continued support and development. You're the man! The 6.1 windows editor GUI do not let me to save the script even if it is added to the 'My Projects' group. It treats them as example project. Thanks for this new update Andreas. And where I can download this 6.1? 6.1 is a major update, so not free. You can order it as other paid versions. Thanks for the reporting, I didn't see the price even I visit the Hollywood page, today I don't sleep, monday and rise early have the guilt.